This is the inbound call log of my private cell phone. Only two of the visible calls were legit. Everything else was a robocall spoofing a legitimate phone number. Only one was blocked. None of the others were marked as telemarketers or scams. I don’t know about you, but I’ve almost given up on using the telephone for any reason—business or personal. You probably know why. 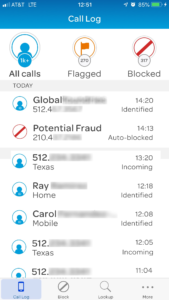 Robocalls and other scams. I get more crap calls than real ones—sometimes as many as 30 to 1. It’s a real problem that the ability to spoof phone numbers has only made worse. I even get robocalls from myself. I don’t engage in robocalls; my Caller ID identifies some of them I receive as coming from a number registered to me. To me, spoofing other phone numbers is a form of identity theft. The thieves are trying to use someone else’s credibility to get you to listen to their scams. First Orion, a company that lobbies for “transparency in communication,” predicts than half of all calls made by next year will be scams. Why Do They Use Those Robocallers? By using robocalls, the scammers encounter virtually no expense. Everyone has a computer, and the software to make the calls and spoof legitimate users is freely available. If even one of the 5.1-billion—Yes! 5.1-Billion—robocalls made last month results in a successful scam, the frauds making the calls are profitable, and that’s all that matters to these sociopaths. I’m using strong language here. I stand by it. “There are virtually no legitimate marketers trying to reach you to sell you something using a prerecorded call,” Lois Greisman, director of the Federal Trade Commission (FTC) Marketing Practices Division told CNN. I agree. The Problem Is Costly, but Is a Solution Even Possible? The problem is that current laws were written to contain the practices of legitimate businesses. If I can’t answer the phone, I stand to lose thousands of dollars for each call I miss. If I pay someone to answer the phone, I’m flushing money down the toilet for each call they take. With billions of calls every month, we’re talking about a problem that costs businesses and consumers billions of dollars every month. Even call filtering software doesn’t make much of an impact, because it can only be reactive. It blacklists known problem numbers. But what about spoofing? We could be blacklisting potential customers and partners. And, even worse for me, my outbound calls get completely ignored as spam, even though we only make live calls to specific numbers. The scammers have trained people not to answer their phones, so we can’t help as many people solve their real estate problems. It pains me to think of people losing their houses to foreclosure because they have been trained not to answer their phones. I don’t know what the solution is without completely redesigning the web and world-wide phone systems. We could ask legislators to make spoofing a phone number a felony. I fear scammers would just ignore the law. They are already ignoring Telephone Robocall Abuse Criminal Enforcement and Deterrence (TRACED) Act, which imposes a $10-thousand fine per call. Until we have a better solution, as soon as you recognize you’ve received a robocall, just hang up. What do you think? How can we solve this massive problem? We get texts now from our doctor. Maybe if you want to contact someone who may not recognize your number, you could text first and ask if you can call? Just an idea.